In humans, one of the paired regions in the anterior portion of the THORAX. The breasts consist of the MAMMARY GLANDS, the SKIN, the MUSCLES, the ADIPOSE TISSUE, and the CONNECTIVE TISSUES. 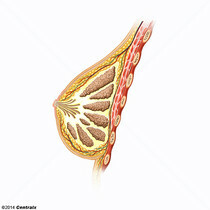 The conic organs which usually give outlet to milk from the mammary glands.